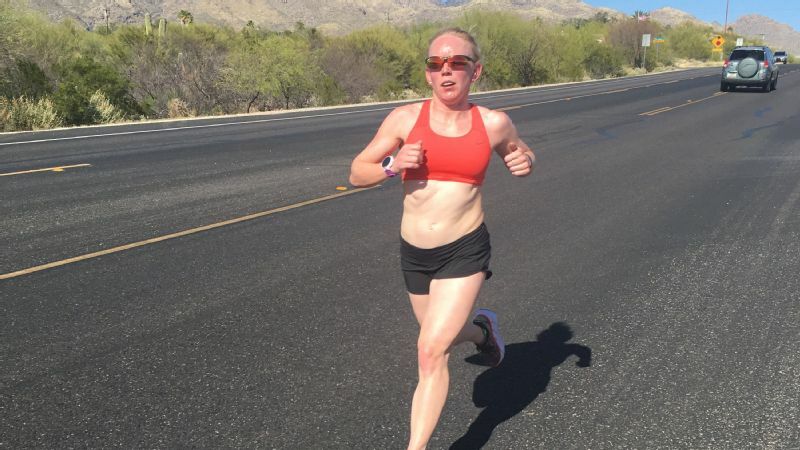 Kelly O'Mara runs down the mountain during the last part of training camp -- a race up and down Mt. Lemmon in Tucson, Arizona -- with a pizza break in the middle. When I told my friends at the San Francisco NPR station where I work that I was going to a triathlon training camp in Arizona for five days they were confused. "Camp? Like summer camp? But what do you do there?" The more I tried to explain that it was a dedicated getaway for athletes to put in a few huge days of training, the more my co-workers looked at me funny. Finally, I exclaimed, "It's not that weird!" "See," said one of the guys, "It's weird that you think that." But, despite his skepticism, amateur athlete training camps are really not that weird. In recent years, they've actually become increasingly popular, particularly in the spring when parts of the country are still covered in snow. It's a way to jumpstart your race plans for the year, take a (pseudo-) vacation to a warm destination, and act like a professional athlete for a couple of days. After all, watching professional athletes train is what lots of regular people come to Arizona for this time of year anyway. In fact, the car rental guy asked me if I was in town for spring training. "Sort of," I said. The types of training camps available range in athlete ability, sport-focus, and degree of luxury. You can do a women's cycling camp in San Diego or a triathlon camp in Costa Rica or virtually anything in between. I even know people who DIY the experience: pick a destination location, rent a house with some friends, buy a bunch of food and beer (how much of each depends on how serious an athlete you plan to be), and start training. I, though, had a very specific goal this year. I was going to Ultraman world champion Hillary Biscay's Smashfest Camp for sub-12-hour Ironman athletes to smash myself silly with some very hard training. Two years ago, I went to Hillary's spring camp because I was in the process of training myself for my first Ironman race ever -- something I thought, at the time, would be a bucket-list, one-and-done experience. I was friends with one of her athletes, and it sounded like the perfect thing to see just how ready I was for the Ironman training process. The answer was: not so ready. I skipped or cut workouts that I wasn't prepared for. And even then I was still in way over my head. Since then, though, Hillary has become my coach, and camp this year was primarily her athletes and friends, all fast and fit. There wasn't going to be any skipping workouts this time around. 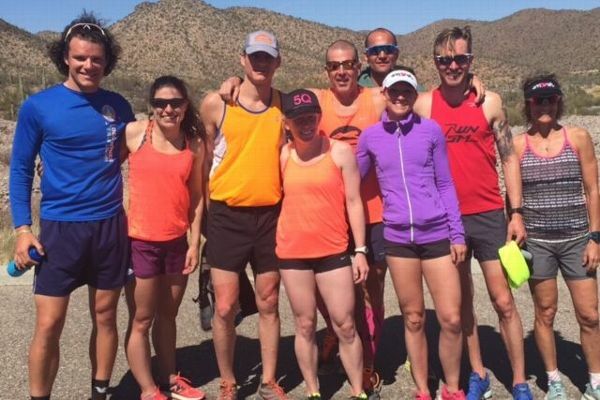 Kelly O'Mara (in the middle in orange) with her training group at camp. Thursday started with a 4:30 a.m. wake-up call so I could make my flight, pick up my rental car, drive to the Starr Pass Resort on the edge of Tucson, build my bike, break a part on my bike, go to the bike shop and get it fixed -- and then meet everyone for a casual hour-long run around the resort. By the time we finally had dinner and made it back to the condo I was staying in with two teammates, I was exhausted. And that was the easiest day. If you'd been to a camp before, you know there's a rhythm to it. There are certain workouts you always do, certain routes you always hit. It's usually led by professional athletes, who can answer questions and give suggestions. It's usually, formally or informally, divided into groups based on speed. Since I'd been here before, I knew that Friday was going to be a hard day. And I was right. We met in the parking lot at 7 a.m. Friday for our 100(ish)-mile ride. It was an approximate distance because if you were fast enough then you'd "earn the opportunity for a bonus 20-mile loop." I wasn't sure I was fast enough, but my teammate and training buddy for the weekend, Leslie, wanted me to do it with her, and wasn't that my goal? To try as hard as I could? Triathlon friends fill an interesting void for me. I hadn't seen any of these people in person more than once or twice in the last year, but we know each other from Facebook and email. And we know that we're all going through the same things together. That made for easy conversation as we rode into the desert and split naturally into groups. About 40 miles in, our group hit the long climb up Madera Canyon, which ends with four miles of vertical, steep road. Just as I thought I couldn't make it the last mile, I saw our group leader in the parking lot and I let out a cheer. I had miscalculated and we were done. Things that end surprisingly early are always exciting. I had given it everything I had and now I knew exactly what it was I had in me. The rest of the ride was much harder, though. We were being led back out of the canyon and through the outskirts of Tucson by Hillary's husband, Maik Twelsiek, known as one of the fastest cyclists on the professional Ironman circuit. The only upside was that at least we were all suffering together. When I thought I was the only one about to fall off my bike, I looked behind me and realized our fastest guy was struggling off the back. It wasn't just me. After convincing Maik to stop at a Circle K for rejuvenating ice cream, we only had one last climb over Gates Pass and then we could coast all the way home. I didn't make it all the way up that climb, though, before I slowed to a crawl, barely getting my legs over the top of the pedal. I was worried I was going to slow so much that I would actually tip over on the hill. But all things come to an end, even the never-ending ride. As soon as got back to the condo, I passed out on the couch for 45 minutes before being shaken awake for our evening swim practice. Training with other people is both harder and easier. It's easier to go a lot harder than you would on your own, and that's exhausting. On Friday evening, I swam the fastest I've ever swum, and then could barely make conversation at dinner. Day two done. Of all of the days, Sunday was the one I had been dreading. 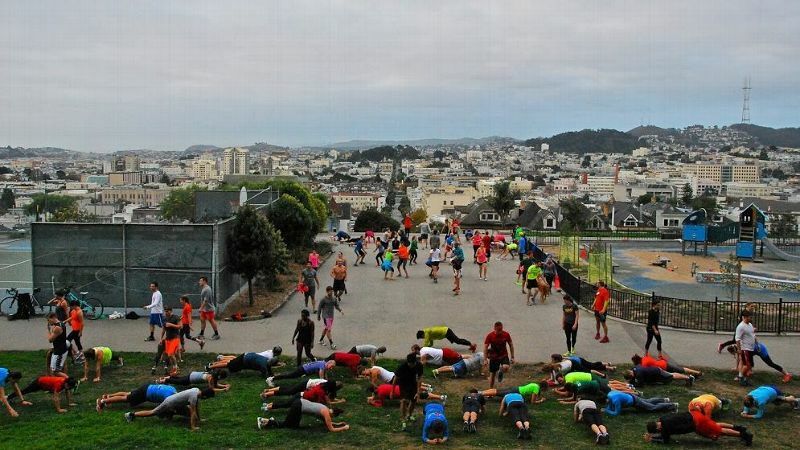 The annual race up Mt. Lemmon, Hillary calls it. Two years earlier, I hadn't realized everyone would race up the 25-mile climb and I was not prepared for that emotionally or physically. This time, I was determined not to get dropped as early. We were sent out in groups from the base of Mt. Lemmon, spaced out so that everyone would get to the top -- the Cookie Cabin -- around the same time. My group, the same people I'd suffered with on Friday, was last to roll out. Despite Leslie's assurances that we were going to hold back for the first 10 miles, be "comfortably uncomfortable," I knew I was going to feel awful from the get-go. I made a deal with myself: You are not allowed to get dropped in the first 10 miles. When I wanted to quit, and that was frequently, I remembered my deal with myself. This is what I'm here for, I thought. I'm not here to quit. 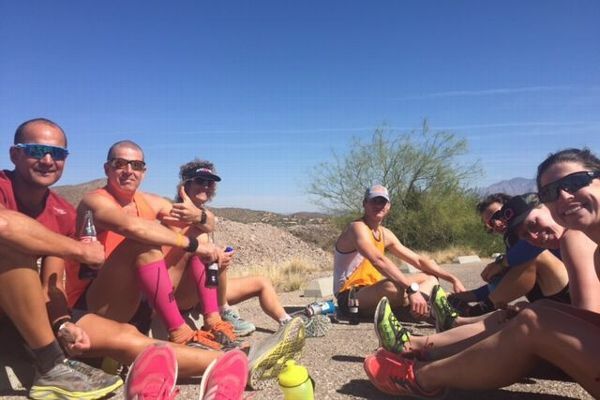 Kelly O'Mara and her training group take a much-needed break in the action. One of the things I like about Hillary's camps is that it's predominantly women -- and fast women at that. And perhaps because they're used to being coached by a woman, the men who do come are used to women training right next to them. That meant my group was a mix. At some point, three of the guys took off with one of the women chasing them, but I stayed in my own little hole of pain, dripping snot on myself. Around 15 miles, what was left of our little group dropped me. I fought to stay just behind them for another mile or two, then I sunk into a hole of self-pity, staring at the mile markers on the side of the road and counting down. There is a false summit on Mt. Lemmon, just past 20 miles, then you descend and climb a bit again and descend again into the town, where cookies and pizza await you. It was on this last descent, as I tried to push it as hard as I could again because I wasn't here to quit, that I started to cry. There was no reason to cry. The hard work was done and I was basically finished. But, by the time I got to the Cookie Cabin and was greeted with the news that I'd actually biked fairly fast, I had to excuse myself to go cry in the bathroom. Mostly I was crying because I was tired -- emotionally and physically strung out. But I couldn't stop because in some way I thought I had failed. Being a female athlete can be hard. There are so many expectations on you, from yourself and from others. I thought I had let everyone down. I hadn't been strong enough or tried hard enough when it mattered. But after a few minutes, I stopped crying and I came out of the bathroom. I ate some pizza, because I needed to eat something. I biked back down the mountain very slowly. And then I found something in myself to run the last part of the race -- four miles -- as fast as I possibly could. Because that's what you do. When a race gets bad, and they all get bad at some point, you have to learn that there is more in you to keep going. 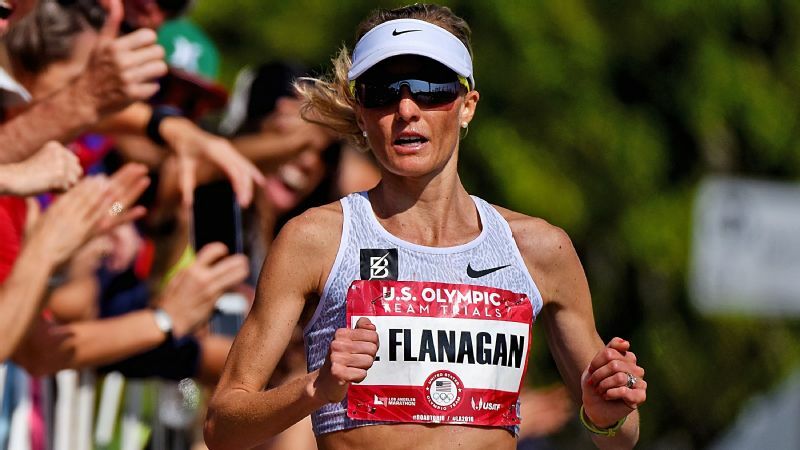 During the last mile I gritted my teeth, tried not to think about how much the pizza was not sitting well in my stomach, and focused on running even just a few seconds faster than I had the mile before, however much I had left. There was an easy long trail run left to do on Monday morning, and we gathered for dinner Sunday night to celebrate our weekend, but training camp was over for me after that four miles. I had given it everything I had and now I knew exactly what it was I had in me. I was proud of myself. And I'd done it for myself.